It's summer (yay!) and I've been craving a sweet and savory kind of cole slaw for a few days now. 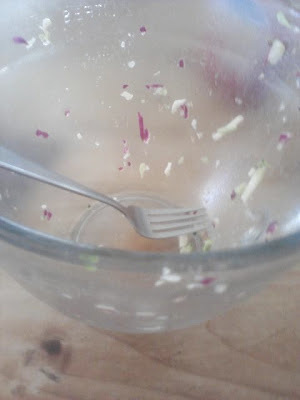 I love the fresh, crispness of a just made slaw and I find it incredibly filling. Yesterday when I was at the grocery store I grabbed one of my favorite pre-shredded slaw mixes - with broccoli, cauliflower, carrots and red cabbage. But what I forgot to get was my favorite dressing. Desperate to figure something out with what I had on hand, I whipped together a quick little dressing that really pleased me. It was light, sweet, hot. Perfect. My secret ingredient. Actually, this "find" is turning into my secret ingredient in quite a few items lately. I don't know what I did without this jar of hotness before. And since the kids didn't want any and Ward was at work, I was sure to enjoy every last bit of it at dinner tonight. Yes. It was that good. Mix up wet ingredients with sugar and pour over the slaw mix. I love spicy stuff and this sounds fabulous!!! I can't wait to try it out! Tara - the sauce is SOOO much cheaper at Target. :) & I just added it to mayo. OH MY WORD! You've got to try it, birthday girl!!! Mmmm...that sounds delicious. I love slaw! hmmm. little known me fact? IVE NEVER EATEN SLAW!!! I think this is the right time to try it! I love that chili sauce! I have some in my fridge! Mmmm! I've recently found that sauce and I love it!!! It's taken me quite a long time to find it and love it too!!!! Enjoy! Sounds yummy! Might have to steal it for my new to us recipe for last week or this week. We are behind again! In love with this. Spicy with a hint of sweetness is great. And I just low slaws in summer. So crisp and fresh. I hope you try it and love it too!!! Mmm I love slaw and I like not having to share it either! Thanks for sharing and now I am wishing I had some cabbage in the fridge. Well, I guess you better get some!!! Ooh, that sounds so yummy. I'll be picking up some slaw and the sauce tomorrow when I hit the store. Oh yeah! I hope you like it! I love the idea of making coleslaw spicy...this is awesome! Thanks for sharing this. Gotta give it a try.